"We like this on salad, chicken wings or boiled and cubed potatoes. If using on potatoes add a little butter to the pot before adding the dressing. If white pepper isn't around, just use black." Combine the mayonnaise, sour cream, buttermilk, garlic powder, oregano, dill weed, chives, parsley, parmesan cheese, hot sauce, Worcestershire sauce, pepper and refrigerate for at least 1/2 an hour. If the dressing is too thick, add a little extra buttermilk to thin. 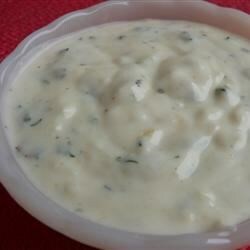 I've tried a lot of Ranch dressing recipes and this one was quick easy and great on our chicken wings and salad. Best one I've tried so far. I was expecting this to taste like Uncle Dan's or other bottled dressing. I made this recipe when I ran out of bottled dressing and I didn't like it at all. I increased the the spices and used fresh ( triple the amount of dry spices) and that made all the difference. This dressing is yummy, however, it doesn't taste like ranch to me! Would give another recipe a try before I made this again. On the positive side, it is easy and quick to make! Quick and easy dressing. I served it with grape tomatoes. Delicious.